I can't stop admiring how Biren from Roti and Rice and Ann from Anncoo Journal bake their Castella cakes. Biren is always clever and detailed with her baking and I enjoy reading all her detailed explanations of the origins and procedures of her baked goods. 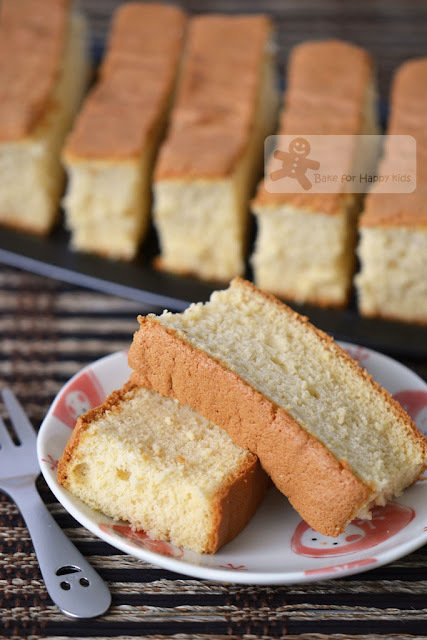 Ann is always brilliant and perfect with all her baking and her Castella cake is a spot-on! A few years back before I started blogging, I always remember a particular Castella cake post that had enchanted me for years! It was the one from The Little Teochew that captured all the "sparkling" angles of her Castella cake. Her post mentioned that she used the recipe from Just Hungry which uses a technique of whisking the cake batter while holding the bowl over a pan of hot water. I did tried baking Castella Cake using Just Hungry recipe for not just once but for more than three times but failed very badly in all my attempts. I thought I was hopeless in Castella cake baking and wouldn't be able to bake a Castella cake in my life. LOL! Until recently, I saw how Cheah from No-Frills Recipes did all her interesting research to bake her Castella cake and how Sonia from Nasi Lemak Lover finally succeed baking her Castella cake after five attempts. I am very inspired by Sonia's perseverance, and didn't want live my life regretting not baking a Castella cake...LOL! And, here I am baking my own honey Castella cake! And, I'm glad that I did it! The Castella cake recipe that I using is from Roti and Rice. With so many recipes to choose, why am I choosing this recipe? All mainly because Biren's recipe doesn't contain any cake stabiliser. I have used Ovalette (a cake stabiliser) before to bake my sponge cakes but didn't like the idea of having an emulsifier in my cake because I reckon that it creates an over-"bouncy" texture. I must admit that the cakes with added stabilisers does stay in their shape very well with the least amount of shrinkage but I think Biren has designed her recipe in the way that the eggs in her cake has been cleverly treated to create a fabulous Castella cake texture. Thanks Biren. This cake is so light and beautiful! I didn't have a traditional Castella wooden cake pan and so I improvised mine according to Biren's instructions. Thanks Biren! This cake is so light and beautiful! 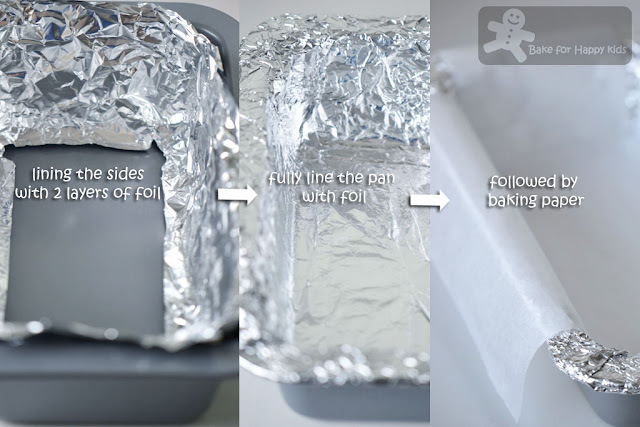 Line a 9 cm x 19 cm (mine is 11 cm x 21 cm) loaf pan with aluminum foil followed by parchment paper. Preheat oven to 325°F (165°C) (or 150°C fan forced). Place egg whites in mixing bowl and beat at high speed (speed 10*) for 30 sec until slightly foamy. Add sugar in 2 to 3 batches until firm peaks form, about 4 min. Add yolks one at a time at medium low speed (speed 4*) until well combined, about 1 min. Add sifted bread flour and beat until just combined. Pour in honey mixture and continue to beat for 1 min. 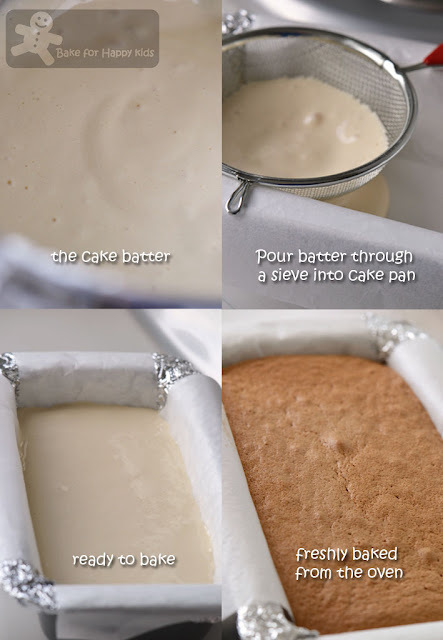 Pour batter through a sieve into cake pan. Press with a spatula to help batter go through sieve. Tap pan lightly to remove air bubbles. Using a spatula, smoothen the top of batter to remove any remaining bubbles. Bake in preheated oven for 45 min or until top is evenly browned. Toothpick inserted into cake should come out clean. Remove pan from oven and drop it from a one foot height onto the counter to prevent shrinkage. When cake is cool enough to handle, remove from pan. Peel off parchment paper and turn it upside down onto a fresh piece of parchment paper. 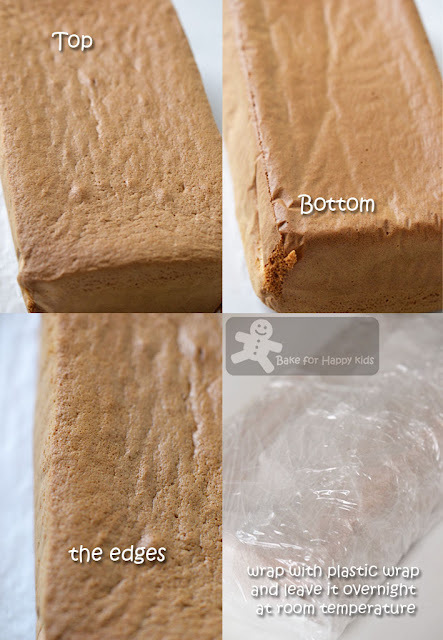 Wrap with plastic wrap and leave overnight at room temperature to preserve moisture in the cake and for flavor to develop. To serve, cut off edges on three sides except the browned top with a very sharp knife. Cut into thick slices using a sawing motion and serve with a cup of tea. *These are the Kitchen Aid Stand Mixer speed numbers. I don't think I am familiar with castella cakes-very interesting. In fact, awesome. Zoe, your castella cake looks so soft and light. Well done! 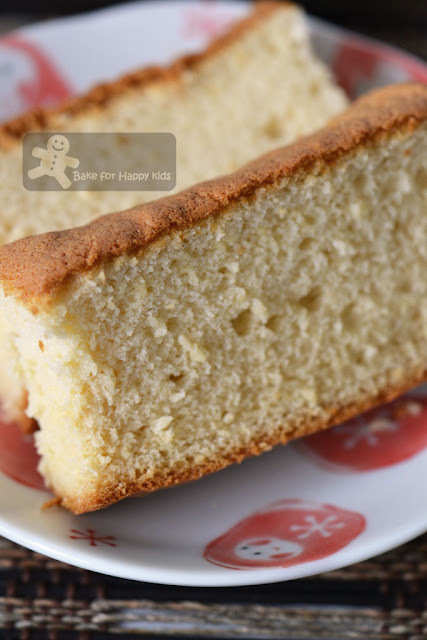 Wowee...so glad you have finally succeeded in baking this castella cake! Your cake is just beautiful! I was amazed myself at how light the cake turned out to be with so few ingredients. haha but its a lovely bug to catch yeah!? Can imagine the aroma in the kitchen when the cake is being baked... makes me wanna just get a cuppa tea and sit by the oven to wait for the cake to finish baking! The cake indeed looks very soft and tender...can imagine how it will melt in the mouth !... Saw many bloggers baking this ! I guess should start on one too !! Lovely piece of cake there !! You have given me hope, Zoe. I have also read all the other bloggers' attempts at making this and it seems like such a sensitive recipe and klutzy me certainly wouldn't be able to handle it. I don't have a castella mould either and wasn't going to get one just to make a failure. I'm going to try it your way with a regular pan. I love these step-by-step photos Zoe! This looks like the perfect afternoon cake to enjoy with a cup of tea or as an afternoon snack for the kids. I am so going to make this! I am sorry I never made a Donna Hay recipe this month. This month has been crazy and I have not been able to do to many complex recipes. I am posting early, my favorite Barefoot chocolate cake recipe. When are you having the Barefoot month? I still have a chicken dish I could do for that. Zoe,also Biren say you should try green tea...it very nice. wow! The cake texture is so soft! yes, I also dislike the cake stabiliser, already copy Biren's recipe too. It looks mouthwatering!I wish I had a slice right now!Kisses,dear! Congratulations! FYI, the real Castella cake texture should be slightly dense but not light. I know the texture after i tasted a honey cake i bought recently..
Yours is done perfecto! The top and bottom has a nice brown skin! Bravo, Zoe! Lovely castella you made, so light. Thanks for the mention too. Good improvising! I was thinking of baking it too and didn't have the cake stabilizer. Looks like yours just prove my doubts wrong! Great one Zoe..the caje looks really nice and soft. Oh Zoe your honey castella cake looks so, so, so soft and beautiful! I've gotta catch this flu and bake the cake too! I saw this cake a few days ago on the net. I have never heard of it, but then again there are so many food things from around the world I don't know that this is not a surprise. This looks very fluffy and tasty and I am putting it in my 'to do' projects! Looks delicious, great shots! I can just taste it. So light and so good. Wish I had a big piece with my morning coffee. hi there! what a coincidence! i also just made this honey castella cake using biren's recipe.. and it turn out quite good :) many many thanks to biren! You are good Zoe! I had never heard of Castella Cake, but this would be perfect with my cup of tea. Your cake is beautifully baked! Very soft texture. I have no corauge to try yet. Thanks for your detail steps I'm sure one day I will refer back. This castella cake looks so soft and fluffy. Well done, Zoe! I've seen this on Roti n Rice. It seems to me that you nailed it too! Hope to try it soon. Can you believe I've never heard of a castella cake? I'm so curious now! Thanks for introducing me to something new- I can't wait to try it! Wow! this looks so soft and delicious!! I love my castella with chestnuts in them! another beautiful castella cake! even though you did not use the wooden mould, it still came out very square, i'm admiring the top and bottom too! well done, zoe, you finally made it!! Before I comment, I must take 1 slice of this super hot cake from you! Hmmmm, yummm!One of my worries of making this cake is how to place the baking paper nicely in the baking pan/wooden mould coz I can never do a good job in this! And as for the techiniques as to how to bake the cake, I'm still a bit scare, haha! Will leave my newly bought wooden mould in my store room first! I have so much to do lately but I do want to try to make this cake. Thanks for the tips and pictorial instruction. They are very helpful. Have a wonderful Sunday. I don't think I've ever seen a more perfect cake...every side is beautiful...and the texture is divine!!! Wonderful job, Zoe!!! I see you using bread flour (high protein flour, right?) and no beking powder. It rises so well. There is a few versions of castella cake that I have tried before. Some can be fluffy but some can be slightly dense and compact. However, the addition of cake stabilser is essential in order to bake the dense kind of Castella cake and so I have chose to bake this version which doesn't require any cake stabiliser. Both the denser and Biren's version can very delicious in their own unique texture and taste. Will stay tune to check out your Castella cake :D Happy Baking! Sorry for my late reply due to personal matters. It is normal that the cooled cake will shrink a little when it is cooled. However, if your cake has shrunk dramatically, I'm guessing that your cake has not been cooked well inside. Have you tried cutting a slice of your cake and have a look inside? Baked twice using your recipe except with matcha powder & some maple syrup added. Texture turned out really soft, fine and light. Didn't line my loaf pan with aluminium foil, baked @ 150 deg C and cake turn out well. My friends love the cake. Great recipe. Thanks for sharing. Happy that you like this recipe. You can try my other Castella cake recipes.